Last Saturday Kelli and I went on a “run away” day. We hadn’t been out on a day with just the two of us with no real plans in a long time. 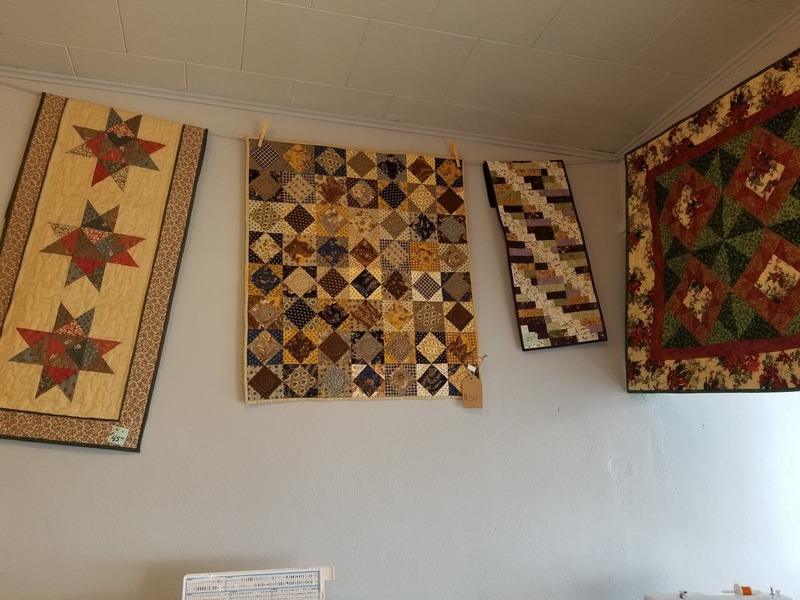 We started out at my house thinking that we would sew….then we ended up changing plans and decided to go to the Amish south of our house near the Hazelton, Iowa area. They have lots of shops and we decided to go. That trip took us to through Oelwein. 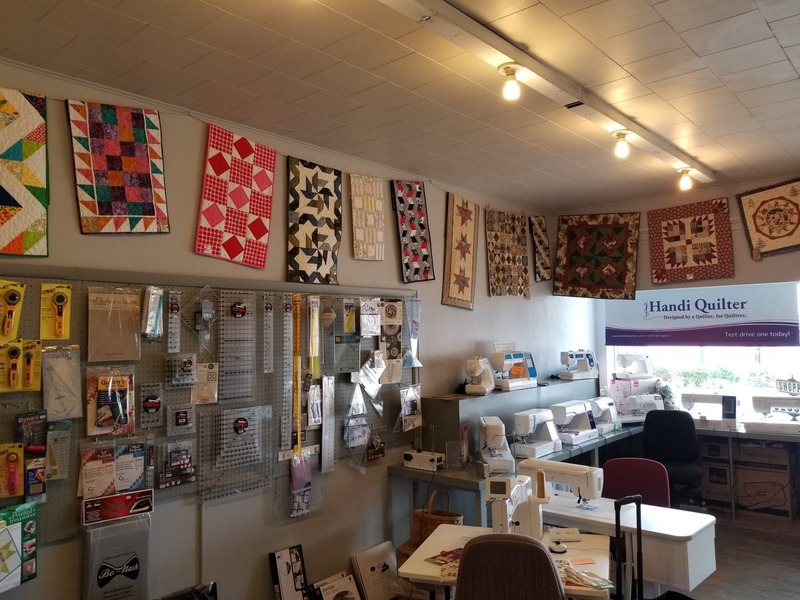 While there we decided to stop in at Lou Ann’s Quilt Garden and Retreat. 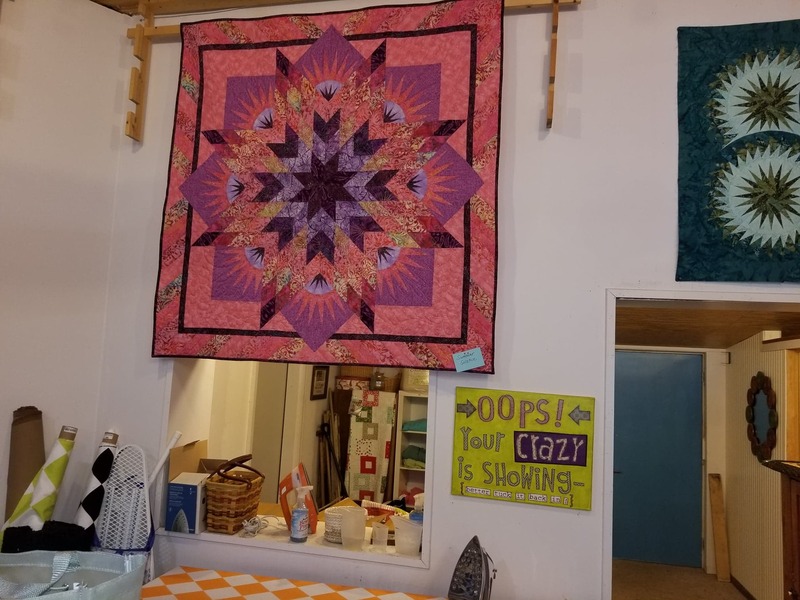 Lou Ann is hosting the quilt retreat we are doing coming up in the beginning of August. Kelli and I are planning on going and so is Kayla. I had heard from Connie that an email had been sent out awhile ago and we never got it so we wanted to make sure we were on the list. Sadly, Lou Ann wasn’t there so we couldn’t chat but we did talk to one of the gals we love that works there. She would send out message on to Lou Ann. I asked and if anyone is interested, there is still room at the retreat. The more the merrier. You’ll have to contact Lou Ann for more info. While I was there I thought I’d snap a few pictures of the pretties that Lou Ann had hanging on the wall. 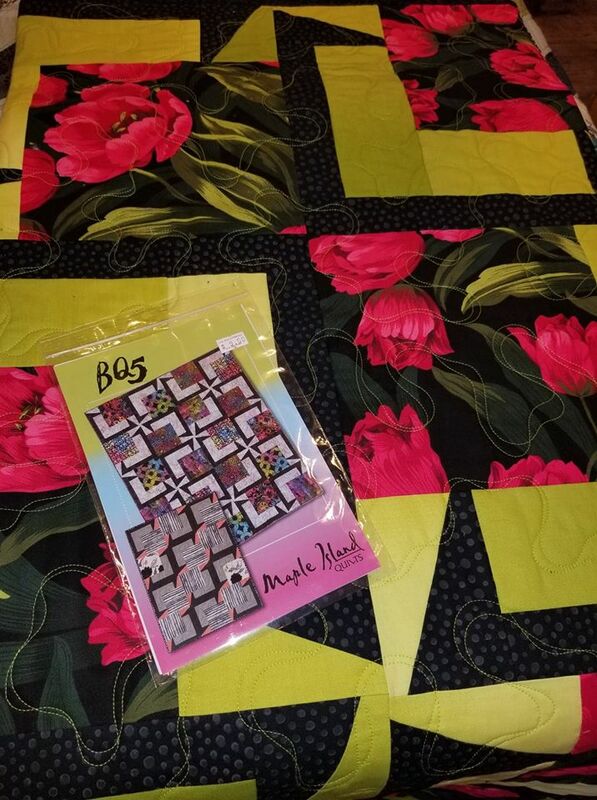 It’s been a bit since I’ve stopped and true to Lou Ann’s business sense, most of the quilt samples had all changed. I love the woven look. What a pretty star!! The machine quilting on it is perfect. Lou Ann has a great style to the shop..a little on the modern side but still very contemporary. Don’t you LOVE this fabric?Can you believe that Kelli and I had enough will power to leave without any fabric?? Not even this! If some is left at retreat time, I think I’ll be getting some. By then I’ll have enough time to think of something to make with it! 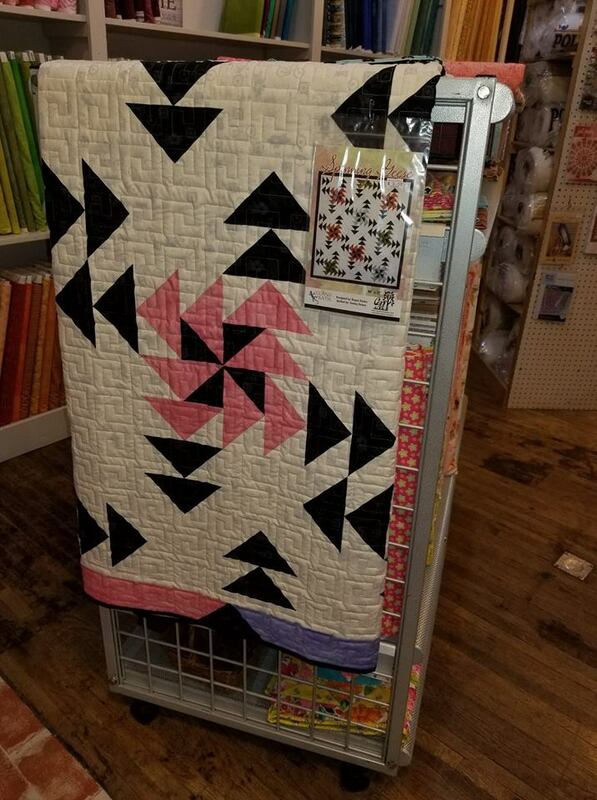 This little cute quilt was hanging…. Check out this beauty. 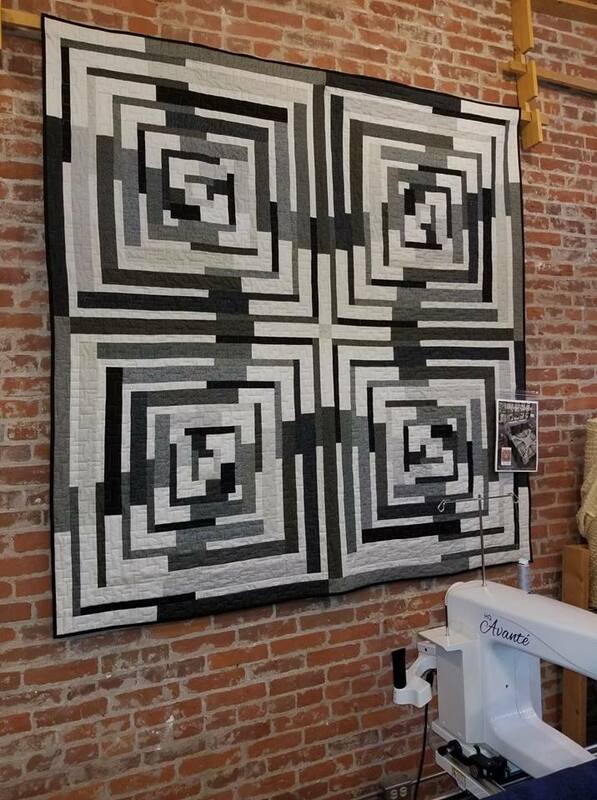 I love the look but exactly not the quilt I’d make. I need my piecing to be relaxing. I’d screw up the placement on this for sure. Lou Ann has a big following of Judy Niemeyer fans. 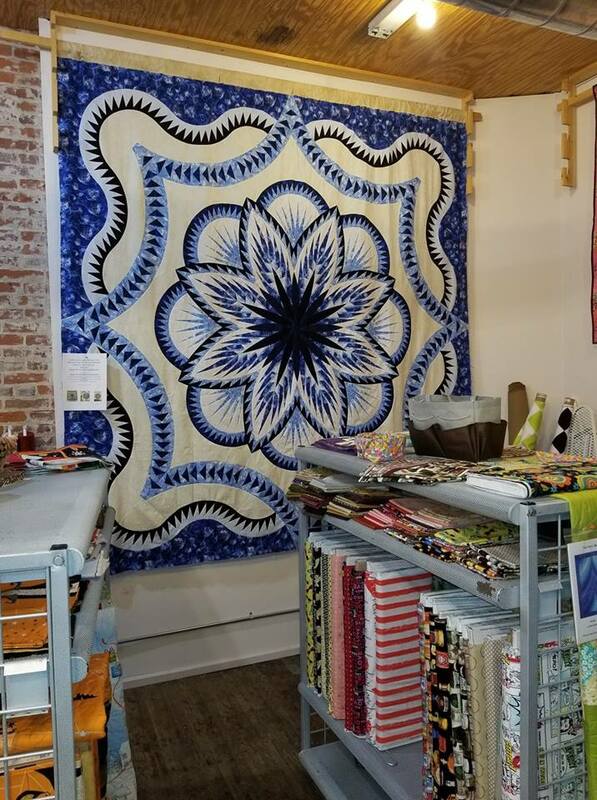 She’s the designer of the quilt you see below. 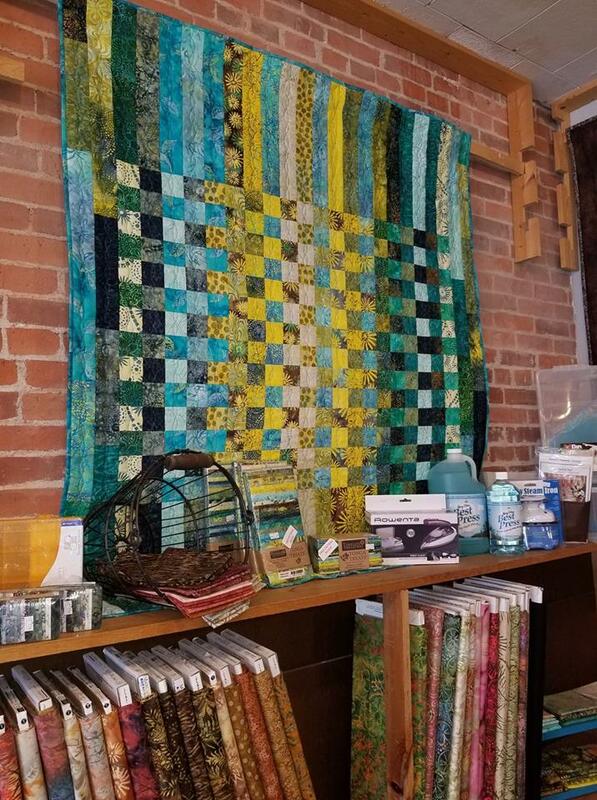 This is all paper pieced…amazing right?! 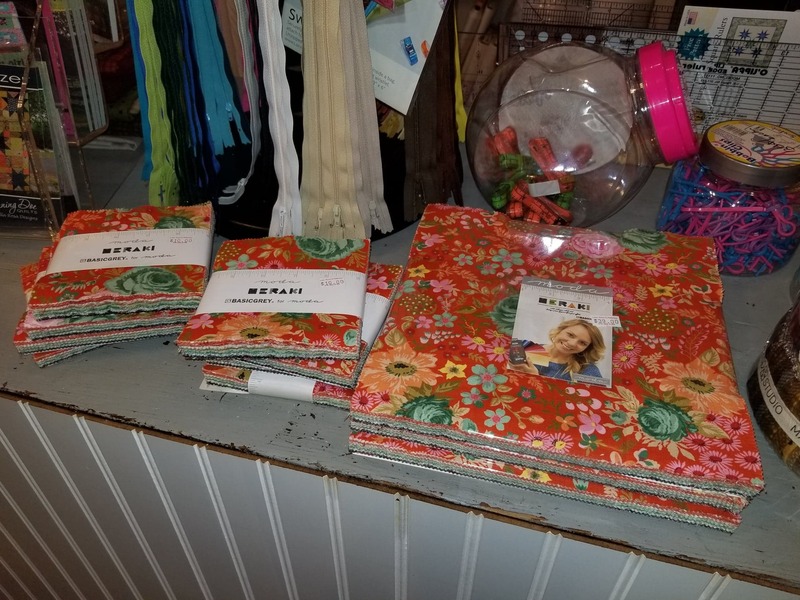 Lou Ann has many of her patterns in stock and hosts classes from certified instructors. 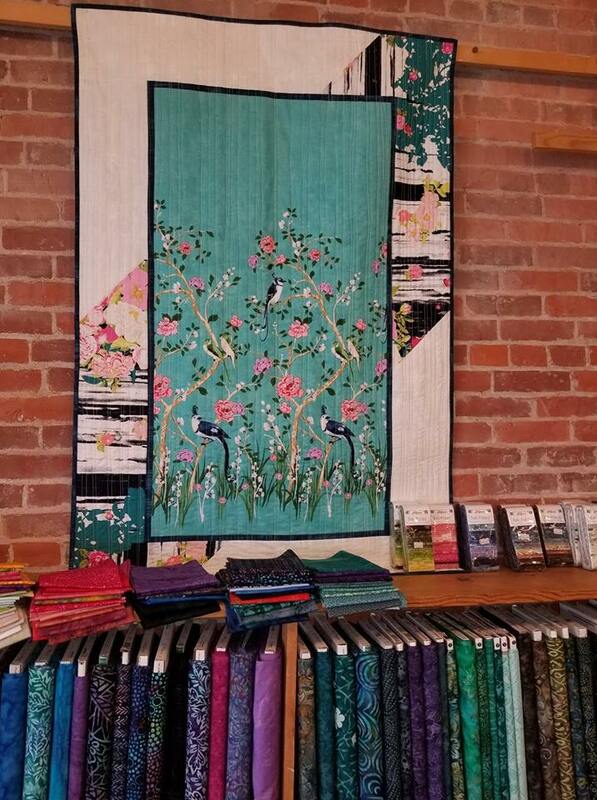 I love to see the quilts…I don’t know that I would be patient enough to make one….Are you? Check this out! What a great use of that big tulip print. That is stunning. 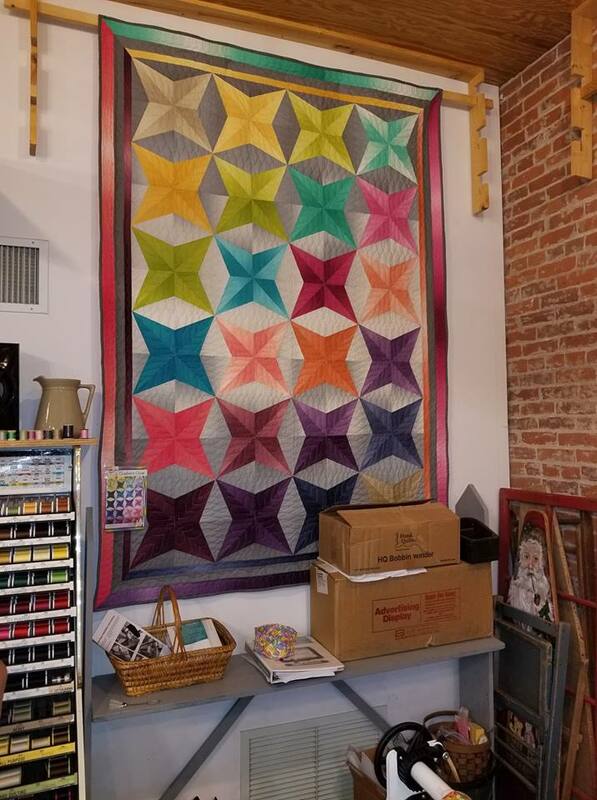 The quilt below looks way better in real light. It was a fun one that Kelli and I both agreed would be perfect for a grandma to make for a grand daughter. She had goodies from Moda’s Basic Gray. 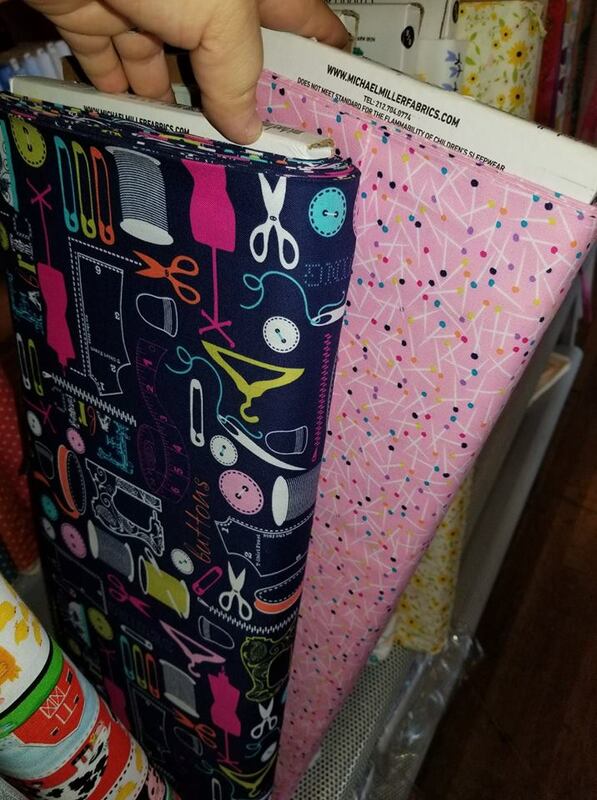 Oh I love her fabric designs. She does the Grunge line which I do like lots! 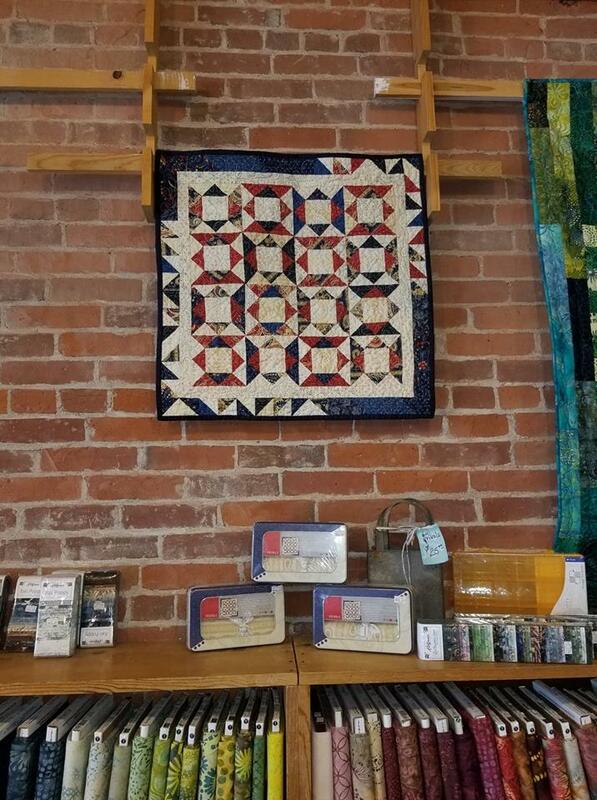 In the front of the store Lou Ann always features great small projects. My favorite was the square in a square. From here we were on to Independence. 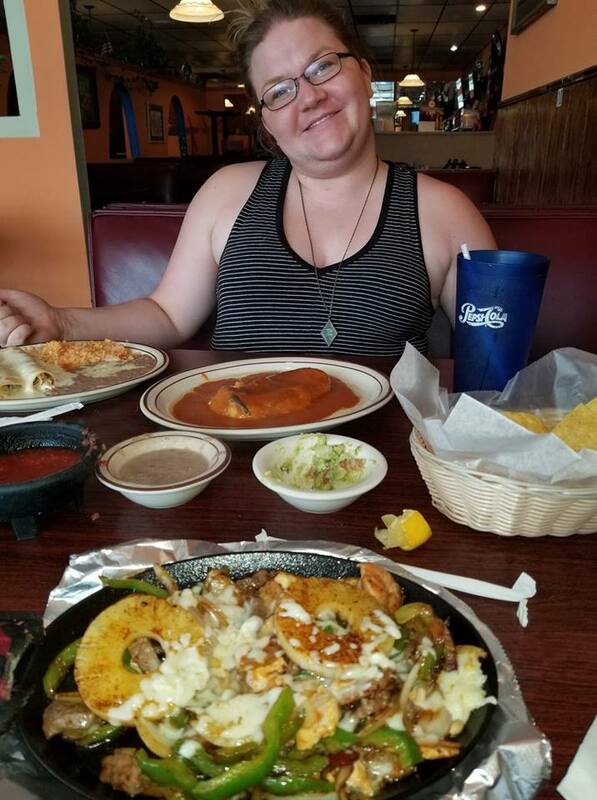 We were on the hunt for Mexican food for lunch and the Mexican restaurant in town has closed. Rumor is one of the Mexican restaurants in Independence will be coming in a opening the restaurant up. I hope they can do that in time for the retreat! Kelli and I really like Mexican. I ended up having Hawaiian Fajitas. YUM! After that we headed up towards the Amish. We stopped at the grocery store, the bakery and then to the bulk goods store. There I ordered peaches, blueberries and cherries. They will be coming in about a month from now….I can’t wait!! I order from them every year and LOVE it! After that we headed home and then in the evening had a camp fire at Kalissa’s and Craig’s. It was a much needed day away with no agenda. 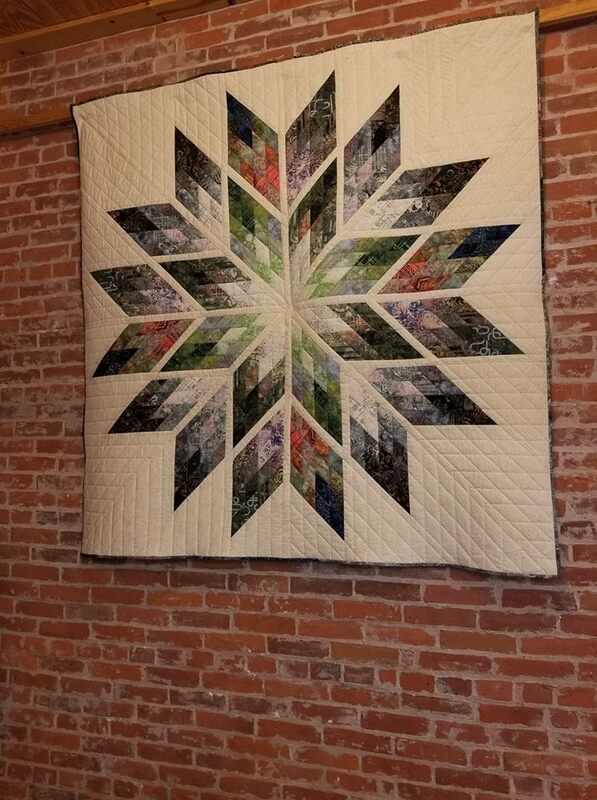 This entry was posted in Quilt Shop Tours on June 30, 2018 by Jo. I’m so sorry I missed you!! We’re counting down the days till we see you at retreat! !